I’ve been really into soup lately. It’s all soothing and nourishing, and super healthy for you when you make it yourself (unless it’s cream based, of course). 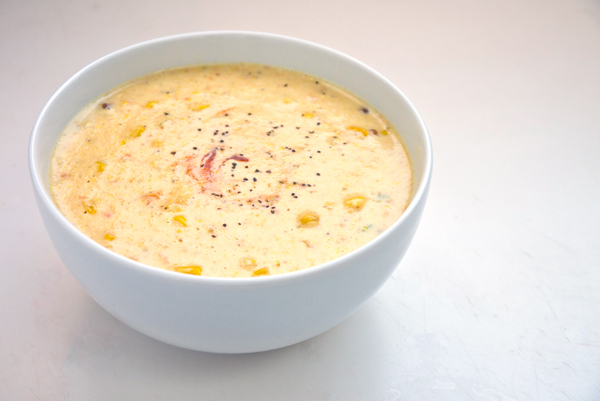 One of my favorites is roasted corn chowder. It’s full of natural flavor as well as being beautifully creamy – and still healthy! The trick to this soup is roasting the veggies until they are nice and toasty, which creates an amazing base flavor. This soup is made with just a few ingredients and a couple of steps. Don’t freak out, but part of the deal is making a roux. Sure, that’s a fancy schmancy French thing, but it’s easier than you think. I’m including step by step pictures in the directions to help you along the way. Yes, that means there is whole milk and butter in this soup (which doesn’t sound all that healthy) but once all those veggies are added in, plus some other stuff, you’ve still got one fit as a fiddle soup that’s ready to eat in 30-minutes. Okay, now it’s time to start that roux. 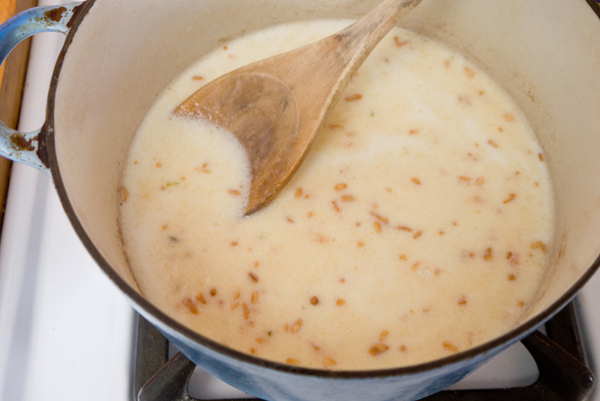 Toss together the salt, tablespoon of butter and oil into a nice soup pot. Warm over medium-high heat until things are all melty and then add the chopped garlic and flour. Give things a little stir…. Now let the flour, butter, and oil simmer together for about 2-minutes or so. 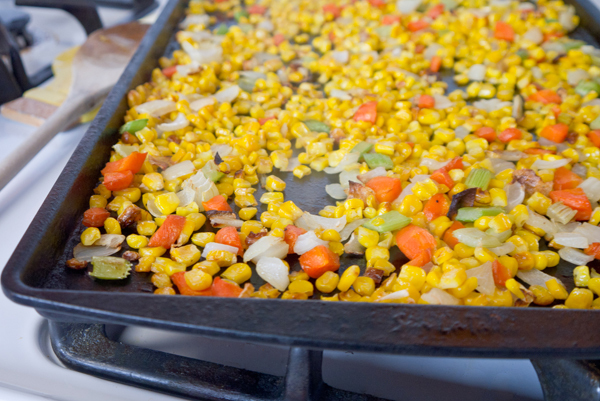 Give things a stir – you don’t want this to start browning, just bubble a bit. 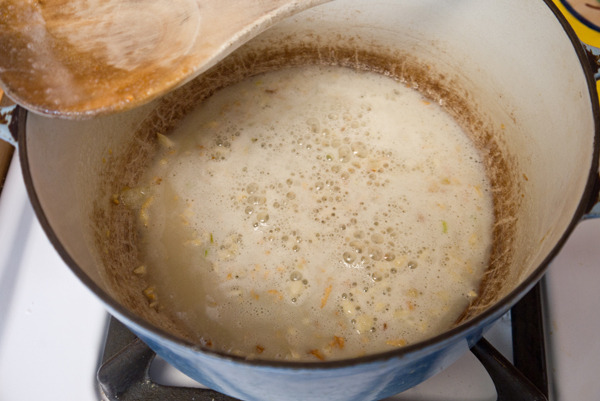 Once the roux pulls together, you can turn the heat way down to low – or even off – and pay attention to those veggies. If they’ve started to brown on the edges, you are ready to go. Pull them out and measure and reserve 1-cup of the veggies. The rest can go into your hot pot of happy milk. 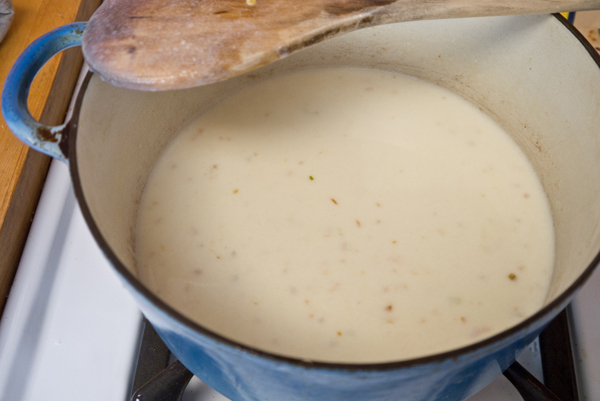 Get out your boat motor (a.k.a hand mixer) and blend together the veggies and milk – otherwise you can puree in batches in your blender, and then add back to your soup pot. 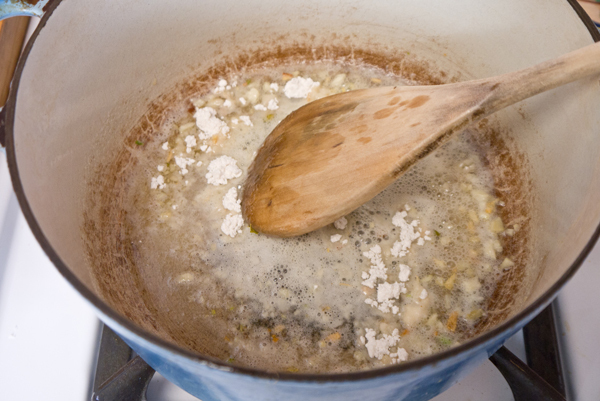 Give your soup a taste test and add additional salt to pepper as needed. Hey, if you like things spicy, dash in some hot sauce or sprinkle in some red pepper flakes. Sounds delish! I’ve tried something similar using gluten-free flour. It still makes the roux and tastes great!